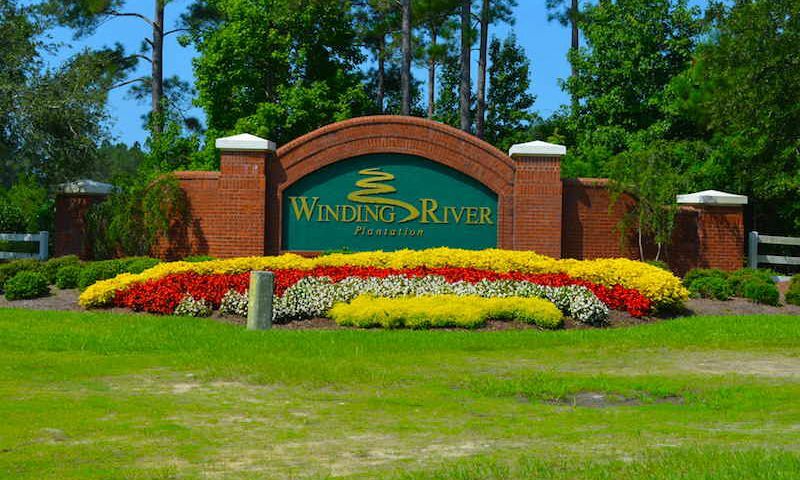 Winding River Plantation is a low-maintenance community located in Bolivia, North Carolina. Upon completion, the community will include 1,200 single family homes. There are many unique private amenities for homeowners including a 9,000 square-foot clubhouse, river house with marina and beach club. The 27-hole Carolina National Golf Club spans the community. Residents at the community enjoy picnics with neighbors, holiday parties, and social groups. Winding River Plantation is ideally located in the warm climate of coastal North Carolina, where residents are always near a beach. Winding River Plantation has a unique variety of private amenities for residents. That includes three separate clubhouses and amenity centers: the 9,000 square-foot Property Owners Clubhouse, River House on Folly River, and Beach Club on Holden Beach. To top it off, Winding River Plantation is home to the Carolina National Golf Club. The club features a 27-hole course designed by PGA legend Fred Couples. The Audubon-certified course weaves throughout the community and includes views of the Folly River. The clubhouse features a multi-purpose room, meeting rooms, a fitness center, and catering kitchen. Outside is a pavilion with a wet bar and nearby grilling area. There’s also an outdoor pool and patio with lounge chairs as well as two tennis courts and a bocce ball court. The River House includes a cozy gathering room with a library as well as a screened patio. Residents can also enjoy the riverside views in the outdoor picnic area. The River House has access to the community’s seaside marina as well as a separate boat and kayak launch. Besides the River House marina, residents can dock at the private marina on the Intercostal Waterway. Outside of the community is the stunning Beach Club located on Holden Beach. The Beach House is a private amenity for residents that features a gathering room, outdoor pool, and patio with ocean views. The Beach Club provides private beach access for residents and can be reached via the Intercoastal Waterway or the community boardwalk. Construction on Winding River Plantation began in 2001. Upon completion, the community will include 1,200 condominiums and single-family homes. Condos in the community run from 1,201 to 2,196 square feet of living space. They include two or three bedrooms, two or three bathrooms, and ample parking spaces. They include features like ceiling fans, walk-in closets, and covered patios. There are a variety of different single-family homes to choose from, each ranging in size from 2,131 to 5,806 square feet. They include two to five bedrooms, two to six bathrooms, and two or three-car garages. Homes were built by multiple builders and in varying styles that include features like gourmet kitchens, walk-in closets, fireplaces, vaulted ceilings, and outdoor space. With its many amenities and residents, Winding River Plantation includes many different lifestyle opportunities. The community hosts several events, social groups, and holiday parties at the clubhouse. There is also ample space and scenic water views for BBQs and picnics to be held throughout the summer. Residents can also swim, play tennis, golf, play bocce, and participate in pickleball. The community’s location on the water allows for boating, fishing, and sailing. Winding River Plantation is ideally located in Bolivia, just 30 minutes from Wilmington and ten minutes from several beaches. There are several grocery stores within ten miles of the community including Lowes Food, Food Lion, and Walmart. Homeowners can dine at Bojangles’, Sonja’s Grill, and Jerome’s Steak and Seafood. Nearby stores include Lowe’s Home Improvement, Sears, and Big Lots. Golfers looking for some variety can play at Lakes Country Club, The Clubs at St. James Plantation, and Lockwood Folly Country Club. Residents find medical services at Novant Health Brunswick Medical Center. Located a few minutes away from Ocean Highway. The community is just 30 miles from Wilmington, which offers a wide range of entertainment, dining, and shopping options. Other things to do in Wilmington include North Carolina Aquarium, Airlie Gardens, and Bellamy Mansion. Residents looking for a long-distance vacation can fly out of Charlotte Douglas International Airport. Winding River Plantation’s low-maintenance lifestyle and golf course setting make it an ideal active lifestyle community in Bolivia, NC. Property Owners Clubhouse - 9,000 Sq. Ft. There are plenty of activities available in Winding River Plantation. Here is a sample of some of the clubs, activities and classes offered here. Condos in the community run from 1,201 to 2,196 square feet of living space. They include two or three bedrooms, two or three bathrooms, and ample parking spaces. They include features like ceiling fans, walk-in closets, and covered patios. Please Note: Floor plans are not available at this time. There are a variety of different single-family homes to choose from, each ranging in size from 2,131 to 5,806 square feet. They include two to five bedrooms, two to six bathrooms, and two or three-car garages. Homes were built by multiple builders and in varying styles that include features like gourmet kitchens, walk-in closets, fireplaces, vaulted ceilings, and outdoor space. Please Note: Floor plans are not available at this time. 55places.com is not affiliated with the developer(s) or homeowners association of Winding River Plantation. The information you submit is distributed to a 55places.com Partner Agent, who is a licensed real estate agent. The information regarding Winding River Plantation has not been verified or approved by the developer or homeowners association. Please verify all information prior to purchasing. 55places.com is not responsible for any errors regarding the information displayed on this website.